An independent watchmaker Ludovic Ballouard has developed a new version of the model Upside Down. This unusual name is derived from the inverted display of Arabic numerals on the dial, with the exception of the figures, which indicates the current hour. For a clearer contrast between a number, indicating the current hour, and eleven other figures next to it there is a white dot. As soon as the current hour ends, the disc makes a half turn, and the figure turns "upside down". The white dot at the time hides under the rim of the disc. The disc with an inverted figure of the next hour also produces a half-turn, and then next to it there is a white dot. The Upside Down watch dial, performed in a dark blue color, has one central hand to indicate the minutes. It is no minute markings. At the 6 o`clock position there is an additional dial with the second`s hand. A sapphire crystal protects the dial. The dial is inserted into the circular platinum case with a diameter of 41 mm and a thickness of 11 mm. Water-resistant - 30 meters. The Upside Down watch operates on the base of the manual winding caliber B01, with the complication “Upside Down”. The mechanism of diameter 35 mm consists of 228 parts, assembled on the 51 jewels, has a frequency of 21,600 vibrations per hour and a 36 - hour power reserve. The novelty comes on a dark blue leather strap with a platinum buckle. 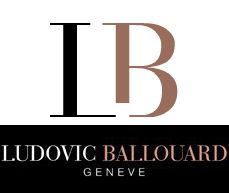 Official site of Ludovic Ballouard. Watchmaker Ludovic Ballouard has delighted the fans with a new model Half Time. Such a unique name for the novelty is chosen of no coincidence, it is due to feature the hour indication.